As suggested by L. Livius Seneca I would like to start a series of threads, all marked with [ΣΤΟΑ] to discuss Stoic original sources. We will start with the Epistulae Morales Ad Lucilium by L. Annaeus Seneca. Every thread will start with the original text. The letters are quite short, so it is not too much to read. Then we will give a few days of time so that everybody interested can read the text and have his own thoughts about it. Everybody is then invited to write a short comment on the letter. Quid ergo est? non puto pauperem cui quantulumcumque superest sat est; tu tamen malo serves tua, et bono tempore incipies. Nam ut visum est maioribus nostris, 'sera parsimonia in fundo est'; non enim tantum minimum in imo sed pessimum remanet. Greetings from Seneca to his friend Lucilius. Continue to act thus, my dear Lucilius - set yourself free for your own sake; gather and save your time, which till lately has been forced from you, or filched away, or has merely slipped from your hands. Make yourself believe the truth of my words, - that certain moments are torn from us, that some are gently removed, and that others glide beyond our reach. The most disgraceful kind of loss, however, is that due to carelessness. Furthermore, if you will pay close heed to the problem, you will find that the largest portion of our life passes while we are doing ill, a goodly share while we are doing nothing, and the whole while we are doing that which is not to the purpose. What man can you show me who places any value on his time, who reckons the worth of each day, who understands that he is dying daily? 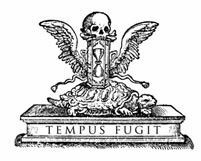 For we are mistaken when we look forward to death; the major portion of death has already passed, Whatever years be behind us are in death's hands. Therefore, Lucilius, do as you write me that you are doing: hold every hour in your grasp. Lay hold of today's task, and you will not need to depend so much upon tomorrow's. While we are postponing, life speeds by. Nothing, Lucilius, is ours, except time. We were entrusted by nature with the ownership of this single thing, so fleeting and slippery that anyone who will can oust us from possession. What fools these mortals be! They allow the cheapest and most useless things, which can easily be replaced, to be charged in the reckoning, after they have acquired them; but they never regard themselves as in debt when they have received some of that precious commodity, - time! And yet time is the one loan which even a grateful recipient cannot repay. You may desire to know how I, who preach to you so freely, am practicing. I confess frankly: my expense account balances, as you would expect from one who is free-handed but careful. I cannot boast that I waste nothing, but I can at least tell you what I am wasting, and the cause and manner of the loss; I can give you the reasons why I am a poor man. My situation, however, is the same as that of many who are reduced to slender means through no fault of their own: every one forgives them, but no one comes to their rescue. What is the state of things, then? It is this: I do not regard a man as poor, if the little which remains is enough for him. I advise you, however, to keep what is really yours; and you cannot begin too early. For, as our ancestors believed, it is too late to spare when you reach the dregs of the cask. Of that which remains at the bottom, the amount is slight, and the quality is vile. I will not further comment on this text during the first days and would like to invite everybody to think about the words and their meaning as well as apparent similarities to other non-Stoic / non-Western philosophical schools. It might also be interesting to know, if you have already had similar thoughts in your life. For this last type of comment, no knowledge in philosophy is required. You can just talk about your experience in your own life. Since there has been no comment on Seneca's letter so far, I would like to add my thoughts to it. Seneca's reminder to be conscious of what we do in the present and not to waste the time that we have is very similar to the Buddhist teaching of "mindfulness". The philosopher Alan Watts explained this concept quite nicely for Westerners. People always plan for future goals, and when they reach them, they have already new future goals. So the life passes without us ever being mindful of the present. And when we look back we are shocked that so much lifetime has already passed and we never actually did what we really wanted to do. It is interesting that Eastern and Western philosophy have independently come up with similar ideas. L. Livius v. c. G. Florio et omnibus philosophis sal. I find this letter so very relevant for our current age. Digital television, streaming music, and the internet all provide us with unlimited access to any sort of frivolous entertainment we desire. This kind of perpetual and liberal stimulation can become dangerously addictive, and as a result, an immense waste of time. For myself, I know that far too often I come home from work, tired and looking for something relaxing to do before getting on with the evening, and end up watching an endless series of inane videos, or reading pages and pages worth of titillating Reddit posts until I suddenly realize that hours have passed. We now know that the peddlers of such media are purposefully designing their platforms to encourage this sort of behaviour (e.g. "recommended for you" sidebars, automatic playlists, etc.) in order to maximize their advertising revenue, and so we the consumers must be particularly vigilant—as Seneca says in his letter—to not let others steal away our precious store of time. To this end I've been purposefully trying to make all my activities, be they otium or negotium, more deliberate, engaged, or (as C. Florius puts it) mindful on my part. Like many I suppose, I can feel dragged through days by what has to be done at home and at work. The days fill themselves up with tasks to be done (and there are more that present themselves than can possible be done in a day). It is easy to spend the few free moments with idle internet wandering, 'educational' or otherwise, or less, when those moments seem too short or unexpected to put to advanage. To take advantage of these moments takes planning and forethought and setting limits. Having life goals that with planning can be fragmented into bitesize pieces (I carry my Collins Gem Latin Dictionary in my shirt pocket) allow us to turn these collected odd moments over time into a whole. Having a vision of those goals can be one force that allows you take back those moments. What resource did you use for the Latin source letter and especially for its English translation? I use http://www.thelatinlibrary.com for the Latin, but the English translation I found https://en.m.wikisource.org/wiki/Moral_letters_to_Lucilius I find is inaccurate. If we are going to go to primary Stoic sources, I would like to recontinue this Seneca Epist. ad Lucilium thread. I have been studying these on my own, but would like discussion on these also. I think Seneca saw us coming when he wrote these. Gaius Florius Lupus wrote: Salvete amici! I actually use this translation too, whenever the Latin text gets too difficult or it touches a tedious subject that I am not that much interested in. Usually I try to read them in Latin. Since I read either the Latin or the English text and do not compare them, I cannot tell how good or bad the translation is. But in the few occasions that I read both, I have to agree with you. I found the translation sometimes to miss the point of the text. But I assumed that this was because I read the Latin text more thoroughly and with all minor details while rushing through the English translation. What surprised me is how often Seneca quoted from Epicurus almost always agreeing with him. But Seneca was probably not the typical Stoic considering his life style (see letter V). My Latin is not as advanced as yours. Although I have 'read ahead' quite a bit in the English, I am focusing on the Latin one letter at a time, rereading aloud if the surroundings permit, adding vocabulary etc. You are correct in your assessment, first two-thirds light weight with the last 'paying' the way of the rest. Of the Latin Classic Stoic canon, what else is there aside from Cicero, Seneca and M. Aurelius? Yes, I also like the rest of letter V. It tells us a lot about the man Seneca. There are very different images of Seneca circulating in the Internet, one based on a misattribution that happened some centuries ago. There is this one of an eccentric looking man who appeared not to be interested in worldly things, an image that fitted quite well with the stereotype of a Stoic, but turned out to be a misattribution. And there is this one looking just like any other upper-class Roman of his time. And this one was apparently the real Seneca. Illud autem te admoneo, ne eorum more qui non proficere sed conspici cupiunt facias aliqua quae in habitu tuo aut genere vitae notabilia sint; asperum cultum et intonsum caput et neglegentiorem barbam et indictum argento odium et cubile humi positum et quidquid aliud ambitionem perversa via sequitur evita. For this reason I think Seneca was extremely important for Stoicism, because otherwise this philosophy was in danger to be carried away into a life at the margin of civilization as it happened to the Cynics. I think you named all the Stoics who wrote in Latin and whose texts are still available to us. Although Epictetus lived around the same time as Seneca, he wrote in Greek. Nevertheless he was very influential for Stoic philosophy, especially his Stoic Handbook, the Enchiridion. I'm in agreement with Lupus re: the comparison with mindfulness, though I think there's a distinction to be made in the sense that Stoic thinking is ultimately very attached to outcomes in a way that is different from what we find in Buddhist and other Eastern practices. To me, Seneca seems to be advising not just being mindful in the moment, but being strategic: know your goals and priorities, reflect and revise them as necessary, focus on what you truly value, and do not use life as a waiting room.